is a Proud Member of our Family! What is a therapy dog? Mango is specifically trained to provide affection, comfort and love to people in hospitals, nursing homes, schools and for us, pediatric dental clinics! MEET MANGO! OUR CERTIFIED THERAPY DOG! Our team is dedicated to the health, safety, and well-being of all infants, children, and adolescents. The opportunity to create a beautiful smile for your child is not something we take lightly. We understand your need to make sure the fit is perfect between your child and the dental practice you choose. There’s a lot to consider when selecting a pediatric dental or orthodontic specialist. Is the practice fully qualified for pediatric dentistry? What kind of environment do they offer? Will my child feel safe? What happens when they need braces? Do they handle general dental needs as well? And so on. 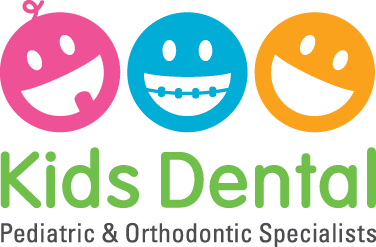 Rest assured, as a dual-specialty dental clinic (Pediatric and Orthodontic Specialists), Kids Dental can seamlessly treat your child from their first dental exam right through their teens – from checkups and cleanings, to fillings and braces. Orthodontists and Pediatric Dental Specialists coming together to provide your family optimal care at any stage of life! WE’RE EXCITED TO TAKE CARE OF YOUR CHILD! MEET OUR FUN-FILLED STAFF AT KIDS DENTAL!